Between Saturday and Sunday morning we got about 5 inches of snow. I snapped the photo above on Sunday as I headed out to collect the eggs and give the girls a little treat (some squash "innards" from our dinner the night before). The girls got their first taste of appreciable snow while we were out of town. They didn't seem to like it one bit. According to my housesitter, they basically stayed inside the run after that first snowfall. But I thought I could lure them out, and indeed I did. Treats and food go a long way when training animals. My dogs respond very well to food treats and affection when I'm training them, and I figured chickens couldn't be much different. It only took a one visit with a handful of raisins, and the girls were out the run door and into the snow. I could see they didn't like how unsteady the snow made them. Little Selma actually flew a short distance over the snow so she didn't have to walk in it. Their feet aren't quite like snowshoes, you see, and so they sink into the powdery snow when they step on it. They don't like feeling so unbalanced. When I head out to open their coop every morning and then back to shut it up in the evening, I compact the snow with my foot steps. So, they've found they can just follow my trail to get to the gate. Now they come up to the gate on their own when they hear me coming outside during the day. I don't know if they can understand words like dogs can, but I was quite full of praise for them yesterday when I saw how they had trekked over to the gate all on their own. I thought they were quite brave and said so as I cooed over them and gave them their treat. I know they're chickens, but they're precious to me nonetheless. The ladies seem to be doing well even though it has been getting below freezing at night. Last night the temp was down to 29 F and I had to crack ice in their water bowl. This isn't the first time that there has been ice on top, but it was much harder to break this AM. Tonight I took a suggestion from Mark and emptied the container while locking up for the night. I have a thermometer in the Eglu now and it showed a temp of 38 F this morning. The girls didn't seem uncomfortable at all, though. They hunker down at night and sleep close together. I took a business trip this week and poor Mark had to get up several mornings to take care of the hens. He was quite happy when I returned a day early. But, while I was gone the ladies seem to have learned that they can get through my rigged-up barrier to the landscaped yard behind the house. The dog walker left a note that the chickens were in the main yard last Tuesday, so he wisely chose not to let the dogs run around. Luckily the hens didn't destroy any plants. They did scratch around a lot of mulch and eat the dill to nubbins, but the dill was popping up in places I really didn't want it, so they sort of did me a favor. Today and yesterday I worked from home instead of going into the office. So, I followed the normal routine yesterday and opened up the run and coop in the morning when I fed them. By late morning, I saw them in the main yard scratching away and eating more dill. I lured them back towards the barrier with mealworms, then crossed over (I can step over the makeshift trellis barrier) and waited to see how they came into the side yard. Mark and I were thinking they were flying over the trellis barrier since we know Betty and Selma are capable of scaling a 32-inch fence. But it wasn't that complicated, at all. The trellis has wide openings. They just hopped through them. Duh. Good thing for them that the dogs weren't out! Once I had lured them back, I locked them in the run with some dill I pulled up for them. (Who knew they liked dill?) This morning, I did not open up the run, but I found some time to get out before dark and let them roam for a while. I unrolled some of that icky plastic mesh fencing (we have tons of it) and sandwiched it between the trellis barrier layers. Then I positioned another trellis on top just in case they do try to fly over the barrier. Now that they know there is more green stuff over there, they may be determined to get at it. I'll have to see if this works. I was in Princeton, New Jersey on my business trip. I was inside all day, but the conference room had a wall of glass that looked onto the woods. The colors were great and it was nice to look out the window for a break. One morning I saw some sort of woodpecker. 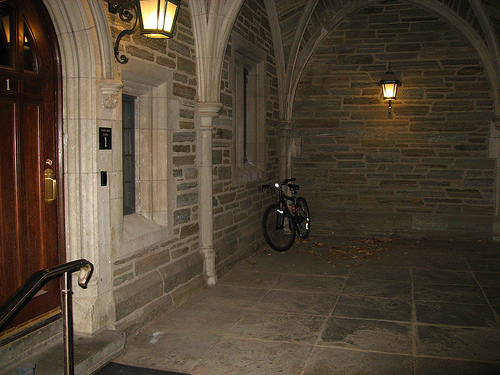 We didn't get out during the day, of course, but one evening we went into town and walked around Princeton University campus and the old town square. I couldn't resist this lone bicycle. So, can I now say I've been at an Ivy League school, even if it was just for one night? This past weekend there was quite a bit of excitement around the chickens. First, Selma literally "flew the coop" on Sunday morning. I'm not sure how long she was outside the yard since I let them out of their coop and run at around 7 AM and then went back to bed for a couple hours. As I was standing at the kitchen sink filling the tea kettle, I happened to look out the window and see Selma busily standing on the alley side of the fence scratching and pecking. It was a bit of a dance trying to catch her, but I did it then promptly reported to Mark that I would need his help clipping wings before he headed out for a bike ride. We had ourselves nearly together and ready to trim wings about 30 minutes later when we nearly lost Selma for the second time that morning. I was standing in the driveway with my back to the yard where the chickens are wandering when I heard a strange thunk from their general area. I turned to see what made such an odd noise only to see little Selma crouching low to the ground near the intersection of the fencing and frozen in place. Maisy and Betty were several feet away also being very still. There was some other movement that drew my eye upwards and that's when I saw the hawk. It was winging its way upwards, around the branches of the maple that overhangs the driveway, over the upper porch and onwards to wherever it was bound. Now, I know there are raptors in Chicago. And I've heard there are Cooper's Hawks active in Chicago, too. But this is the first time I've seen any sort of raptor in my neighborhood. This has made me pretty nervous, I must say. I think that the way the yard is laid out, with all of the raised beds and hoop covers, and tall fence on 3 sides, etc. makes it quite challenging for a hawk to swoop in and grab a chicken, but I'm not sure. I can't put bird netting over the entire yard, nor can I keep the chickens confined to their Eglu run all day every day. They've really been enjoying having the run of the yard every day, and I've noticed that I don't get so many soft eggs when they can roam. I think it's best for their "mental health," let's just hope it isn't bad for their physical health now that the hawks know there are tasty chickens roaming my yard. We did get down to business after the excitement and clipped the primary flight feathers on one of Selma's wings and one of Betty's wings. As if they were trying to prove that the exercise was pointless, later that day both Selma and Betty managed to flap their way up to the top of the fence running along the driveway (which is just under 4 feet tall) and sit up there mocking me. I had to pull out all of the various trellises I've collected over the years and line them up along the inside of the fence. That adds at least a foot of height and hopefully will keep the naughty chooks in their yard. It was a relatively warm and sunny day on Sunday so I gave their Eglu a thorough cleaning, as well as watering all the planting beds. I couldn't resist taking a short video of the Maisy and Selma taking a dust bath in one of the unused beds. Did you know chickens purred? Well, I had heard they make quite a few noises, but I really didn't believe it until I heard it myself. After I close up the Eglu door at night, I usually pop open the egg hatch door to do a "head count" and make sure all 3 chooks are accounted for. Tonight when I did this I saw Maisy and Betty nestled up next to each other near the hatch door, and Betty was purring. Yes, that's right, she was making the cutest little purring noises! I was also disturbed to see that Selma appeard to be roosting in the nesting box. This is the first time I've noticed this behavior, and it is not usually encouraged. I'll keep an eye on her and make sure she doen't make a habit of it. I must say, the ladies are full of surprises these days. I've been letting them roam the yard even when I'm not home and all seemed to be going well…until today. I started doing this about a week ago because it seems to be keeping them happy, and there don't seem to be any dangers during the day. A couple weeks ago when I had to go to the office every day, I found that hens were getting very disturbed from so many days confined to their run. One day I came home late to find that there were 2 soft eggs laid in the run. Then the next day I got home about 30 minutes before dark, so I let them out to roam for a short while. Maisy stopped at a certain point during her perambulations, squatted down, and laid a soft egg right there in the yard! Usually the girls are very good about laying in the nest box. I figured if they were engaging in such odd behavior it was because they were stressed from being confined to the run for so many days. The days are getting so short now that it is nearly dark by 6:30 PM. If I'm lucky, I can be home by 6, but that is not much time for the chooks to roam. So last week I decided to open the run door in the AM even on the days I went to the office, and then shut them up after dark. As I said, this seemed to be working OK until today. In the early afternoon, I took a break from work to run to the grocery store. When I returned, I unloaded the bags from the car and carried them to the back porch. (Here in Chicago, it is typical for the garage and the house to be unattached, hence all this juggling of stuff from one point to another to another.) Then I closed up the garage and was preparing to open the back door and carry the bags into the house. Then I heard my name being called. I turned towards the sound, and as I did I saw something funny out of the corner of my eye. It was my neighbor 2 doors over pointing out that my chickens were…perched on the fence next to the driveway. Yep, I had seen that as I turned, but wasn't quite sure if I was seeing it right. There were Betty AND Selma perched on top of the fence looking at me expectantly. My neighbor asked if I thought they would try to get away. I said no, it looked more like they expected me to give them a treat. Then I marched over and shooed them off the fence. Only to have them fly right back up! I shooed them off again. Selma flew up one more time. After a third wave off the fence, she seemed to get the idea. I kept peeking out the window at them this afternoon, but didn't see any more chickens perching in dangerous places. This does worry me, though. I have to either keep the chickens in their run this week, or have faith that they won't fly up onto the fence while I'm not here. I have a very demanding week at work (seems like I keep saying that lately!) and need to be in the office every day. The girls have been laying very well since I've been allowing them to roam every day, and I'd prefer not to mess with that. Would clipping their wings help in this situation?